GRIPiTe®C60 Contact Adhesive is a powerful solvent free two way stick adhesive. It has a short open time with bonding capabilities for Vinyl Wall Cladding, Skirtings, profiles and floor coverings on absorbent and non-absorbent substrates internally. 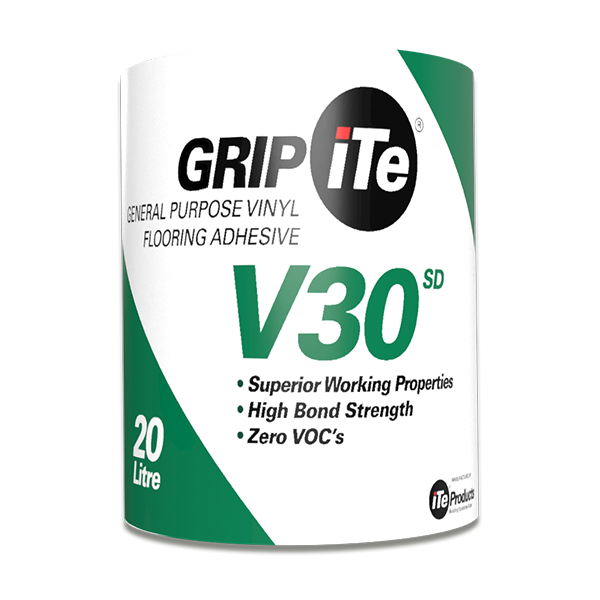 GRIPiTe®C60 Contact is suitable for use with PVC or Vinyl Flooring, Linoleum, LVT’s, Rubber Flooring, Needle Punch Carpeting and most floor and wall coverings. If in doubt please contact our technical staff. GRIPiTe C60 is safe to use on many materials, including polystyrene and solvent sensitive products. Containing no VOC’s, GRIPiTe®C60 is GBCSA compliant for green buildings, is absolutely safe for use in confined, poorly ventilated areas and has a very low odour emission. 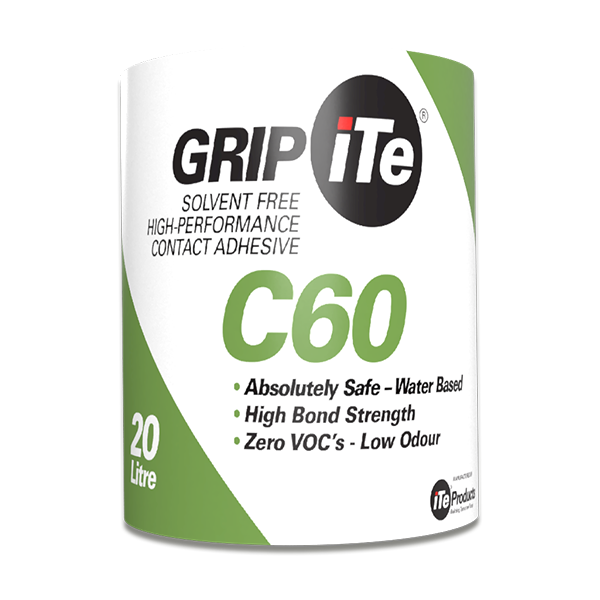 Unlike non-flammable solvent based contacts, GRIPiTe®C60 is not harmful to the applicator. GRIPiTe®C60 Contact is available in 5Litre and 20Litre buckets. We recommend that SANS 10070:2012 be complied with. If applying over previously painted or coated surfaces, it is advisable to ensure that these are sound and capable of carrying any weight and not delaminating. It may be advisable to degrease steel or aluminium surfaces prior to application to ensure proper bonding. Wooden surfaces may require priming with GRIPiTe®C60 to promote better bonding. NB When the two adhesive applied surfaces are brought together, subsequent movement of the sheeting or material is possible. It is important to line the material up correctly before bringing the surfaces into contact with one another as movement may lift adhesive. When fixing materials to substrates other than cementitious screeds or substrates, please consult with iTe PRODUCTS’ technical staff. 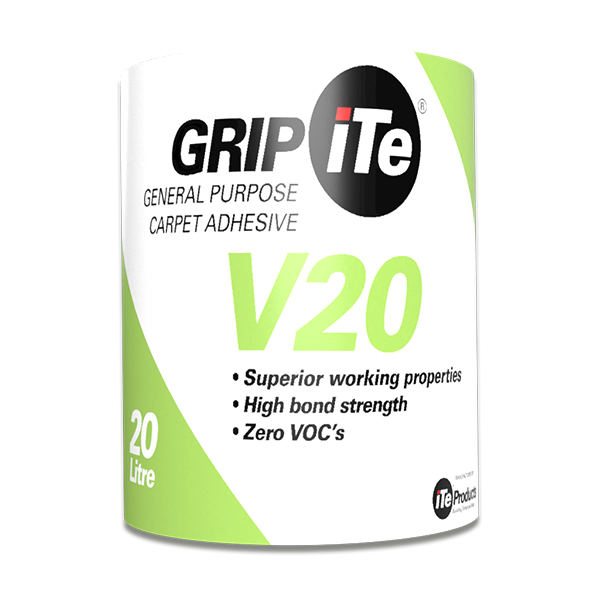 iTe PRODUCTS GRIPiTe®C60 Contact is manufactured to comply with the required standards for use as an adhesive for bonding vinyl floor coverings and synthetic stick-down carpeting to cement based substrates. This warranty is based on the substrate being sound, dry and free of contamination. All application is to be carried out in strict compliance with the method statement as issued. iTe PRODUCTS further warrants that the products are manufactured to strict quality control standards and that the products supplied are free of defect. We cannot be held responsible for failure due to excessive moisture, flooding or the substrate failing for any reason, or application of the adhesive in a manner not suited to the circumstances. GRIPiTe®C60 Contact Adhesive functions when the two pre-adhered surfaces have flashed off, leaving tacky but dry adhesive films on them. Care must be taken to allow the adhesive films to dry sufficiently to prevent entrapment of any water from the adhesive to be trapped between the surfaces, which will retard the curing and final bond strength. Use a mohair or foam roller to apply the adhesive in a thin, fine even layer onto each surface, and wait for the two surfaces to dry. When dry, line up the material to be bonded carefully, and place the sheet into the adhesive, rubbing it into position to ensure no air entrapment. When finally positioned, rub the surface entirely, bring pressure to bear to promote the best possible bond. When porous materials are to be bonded, GRIPiTe®C60 will allow for the surfaces to be bonded before they have flashed off completely, and no volatile entrapment will occur, and given its solvent free properties, it will not have any effect on the materials. GRIPiTe®C60 Contact is applied at a rate of 4m² per Litre, per side, depending on the roughness and porosity of the surface being adhered to. It is applied to both surfaces to be bonded, ie the screed or wall plaster and the back of the material to be bonded. Provided sufficient bridging between the surfaces is possible, the adhesive should be applied as thinly as possible, at a rate of approximately 200ml per coat, using a mohair or foam roller. NB When the two adhesive applied surfaces are brought together, no subsequent movement of the sheeting or material is possible. It is important to line the material up correctly before bringing the surfaces into contact with one another.